Because Southern California's landscape never fails to amaze me! Yes, I'm properly located in the heart of Downtown LA with all its hustles and bustles. But who would have thought that this beautiful landscape from Highland Springs is a driving distance away from me? How do I know that? Because I embarrassingly procrastinate enough that I have to physically drop my suite to the site! But let's not talk about my bad time-management habit and go straight to this wedding suite I did base on Kaleb's beautiful vision. As always, I want something elegant, understated, and with the bespoke quality to match everything else in this shoot. 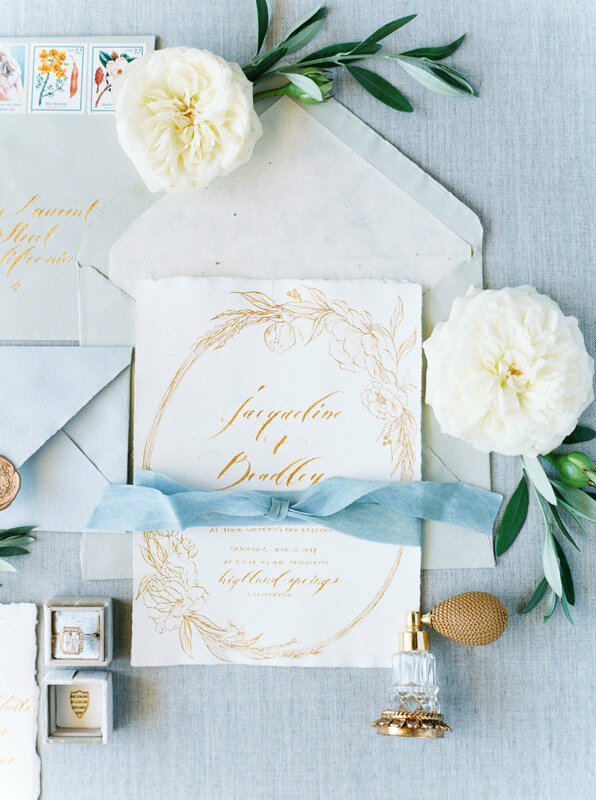 I used two different shades of Arpa handmade paper envelopes to highlight the prominent colors from this shoot. For the invitation design itself, I draw a simple botanical illustration as the border with a combination of calligraphy and lettering. I use some silk ribbon that has a hint of blues and greens to ties the suite and a simple wreath wax seal to finish it. In the end, Maria Lamb's gorgeously captured all of our hard work with her beautiful lense!